Our Honorable Prime Minister has launched three schemes for people of India. Those three schemes include Pradhan Mantri Jeevan Jyoti Bima Yojana (PMJJBY) and Pradhan Mantri Suraksha Bima Yojana (PMSBY) and Atal Pension Yojana. 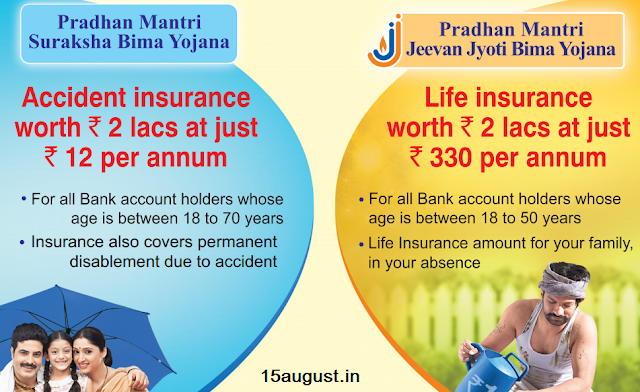 Here we will have a look at difference between Pradhan Mantri Jeevan Jyoti and Suraksha Bima Yojana. The difference between Pradhan Mantri Jeevan Jyoti and Suraksha Bima Yojana is given below. 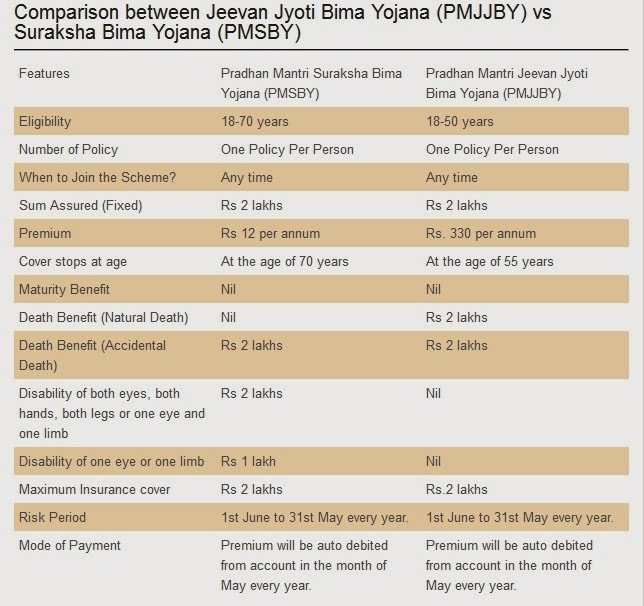 As you can see in this image, the eligibility for Pradhan Mantri Suraksha Bima Yojana is 18 to 70 years and there is 18 to 50 years for Jeevan Jyoti Bima Yojana. The benefit of Suraksha bima Yojana is senior citizens also can avail this scheme. You can take only one policy per person in both the schemes. In addition you can join the scheme any time. The basic sum assured for both the schemes is Rs. 2 Lakhs. The premium payable per annum for Suraksha Bima Yojana is just Rs. 12 per annum and there is 330 Rs. per annum for Jeevan Jyoti Bima Yojana. You have to pay nominal amount of premium for both the schemes and it is very beneficial for poor people of India. Any one can afford to get this scheme and pay the premium yearly. The cover stops at the age of 70 years in Suraksha Bima Yojana and there is 55 years of limit in Jeevan Jyoti. Moreover, there is death benefit in Jeevan Jyoti Bima Yojana if the person dies naturally and no death benefit for natural death in Suraksha bima Yojana. There is accidental death benefit of RS. 2 Lakhs in both the schemes. If the person gets disability of both eyes, both hands, both legs, or one eye and one limb then 2 Lakhs will be given to the subscriber in Suraksha bima Yojana. If the person gets disability of one eye or one limb in Suraksha bima Yojana then he/she will get Rs.1 Lakh. The maximum insurance cover of both the schemes is Rs. 2 Lakhs. The risk period of both the schemes is from 1st June to 31st May every year and the premium ill be auto-debited from your account in the May month every year. This is the difference between Pradhan Mantri Jeevan Jyoti and Suraksha Bima Yojana. Ask a question for any doubts here! Take a look at here for more information and helpline number of both insurance schemes. Or you can visit official website at Jansuraksha.gov.in.